What is it about old familial favourites that make them so daunting to me that I shuffle my feet in eternal hesitation to even hazard an attempt? I’m fine and dandy with things I’ve never made before, like soufflé and opera cake. I dive head first into dishes from other shores, like Thai green curry and Arni Youvetsi. But when it comes to familiar, well-loved dishes with long histories, I cower like a mouse facing a lion. I supposed you could say that when it comes to trying new things I am all daredevil and bluster, but when much is at stake (like wreaking havoc on an old family dish) I get cold feet. Well no more! I’ve conquered my fear of making adobo (I now love making it – as only someone who has started making it late in life can). We’ve successfully managed to start down the tricky road of paella. And now it was time to revisit callos (Callos a la Madrilena…but just callos from here on in to keep things simple). I made callos for the first time 3 years ago when I got married. No, not to make it for my spanking new husband, but for K’s talented then-boyfriend, now-husband J. He designed our fabulous save-the-dates and callos was his preferred mode of payment. So I promptly set about harvesting culinary information from my grand-aunt and my mum-in-law (two experts in our family) and cobbled together a recipe. Now if there is anything I can say about our old family recipes it is this: there is no recipe. And back then, I was not as adept as I am now at recognizing the subtleties and nuances of these age-old, hand-me-down methods, or knowing how to extract the correct information from beneath memory and reminiscing, or asking the right questions to translate a technique from past to present. In short, although J’s invite design was indeed fabulous, my callos were not. They came out much too watery no matter what I did. I spent most of the night over a huge pot of what looked like a Spanish-style stew that simply refused to make the leap to a proper callos. J and K did say the flavour was good…but it hadn’t made the cut in my book. I never made callos again. Like Thomas Keller riding back into Manhattan on a golden chariot made of French Laundry to build a palace called Per Se, victory was finally mine. As with the paella, I have no recipe yet. Perhaps there never will be. A basic framework, yes. An exact recipe, probably not. Dishes like these are meant to be tucked in here and taken out there and tweaked to your own brand of deliciousness. Here’s what I did: I divided the work into two days. This is a dish that needs a lot of patience and love so I broke down the steps so I wouldn’t get too tired and ornery. On day one I prepared the meat and the stock – the backbone of the callos. Because of my first attempt’s lack luster performance, I decided to stick with a small batch for now. I used roughly 400 grams each ox tail, ox feet, and tripe. I wanted a good mix of gelatin-rich joints, a little meat, and of course the tripe (I love tripe). I bought the tripe already clean, as you can find in most supermarkets if you search and ask questions. This allowed me to nix the step of multiple boiling and tossing of liquid (which I did the last time…which caused me to lose all my gelatin from the other meats…which caused the watery callos). That being said, go ahead and brush your tripe with salt and rinse under running water if you feel it isn’t clean enough. Feel free to experiment with other callos-friendly meats as well (I know I certainly will in the future!) like pig’s feet and face. Cover the meats in water to about 1-2 inches above them, bring to a boil and skim off the scum. Try to get as much of the scum off as you can. Once all the scum has been removed add a piece of ham bone (if you can get jamon Serrano bone use it! ), some halved red and white onions, lots of whole black peppercorns, and a couple of bay leaves. Simmer until all the meats are soft. This took me about 6 hours. Be patient! It takes time to coax the meats into tender submission, as it does to render all the gelatin from their bones and reduce the stock to a sticky, glistening mess. Don’t rush this part I implore you. Do this on a day when you have to stay home and do a lot of work/chores. Just check on your pot every once in a while — add more liquid if the water level gets too low and fish out meats that have already gotten tender before the rest. You want a stock that is reduced, glossy, and a bit sticky. When you are almost there, taste and adjust the seasoning – do this at the very end as you may not need any additional salt. Once done, I took the meats out, deboned them, and cut them into chunks. Make sure you get all the bits! Strain the stock (I didn’t have much left after all that reduction – but that’s ok…if it’s good and rich you won’t need copious amounts) but don’t lose any of the gelatin. Once cool, I stored the stock and meats (separately) in the fridge. When chilled, my stock turns into a jiggling solid mass – one piece of solid gold flavour and deliverer of unctuousness. I have yet to explore freezing options but will do so soon! On day two, you can now breathe a sigh of relief as you get ready to make your callos knowing that the long, arduous part is over. I heated some olive oil in a pot and sautéed lots of chopped onion and garlic, and a bay leaf. Once the onions were soft I added some canned roasted red pepper sliced into strips (you can roast and peel your own as well) along with a couple of dollops of carne de pimiento choricero (bottled pulp of a type of red Spanish pepper). I then added some chorizo bilbao (or any Spanish chorizo meant for cooking – use something fresh but strong) and some chopped bacon slab. Once they rendered their oils I deglazed the pot with some red wine and let the alcohol cook off. Add some pimenton de la vera and, if you like and additional spice kick, some cayenne or chili (I do and I did). After giving this a few stirs I added a 400 gram can of chopped tomatoes, juice and all. I cooked this until pulpy (evaporating much of the liquid). At this point you can remove some of the oil if it looks excessive to you. 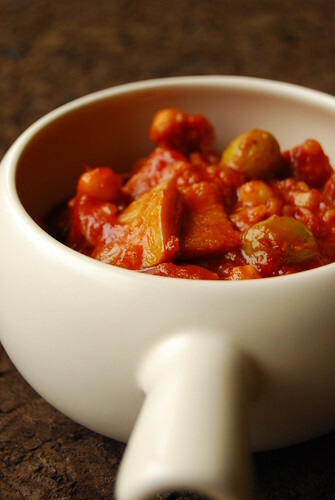 I then tossed in the reserved meats, stock, some garbanzos (about half a 400 gram can, drained), and some green olives (unpitted) and cooked it until it all came together in a bubbling, sticky pot of goodness (which doesn’t take too long – watch your pot!)! C loved this version – I know because of the many high fives that came my way with dinner, plus he had it until the last drop was gone! He declared that it must be logged down into our own tome of family recipes (which now consists of a furry purple notebook unbeknownst to him). So in it went! ***Our callos was an amalgamation of recipes and methods from our two families, patched together to form something that both C and I loved. I also took inspiration and technique from another wonderful cook’s informative callos post. I am savoring the last of my callos leftovers as I write this comment. I sneaked a tupperware's worth home from a recent family get together, and treat it like gold. I don't know how to make Callos and was searching for a recipe online as my mother does the "a pinch of this, a dash of that" templada. I totally understand the cold feet for attempting a time tested recipe. Cheers on your attempt, and success.